As a young man pianist Ian Wynne played with the Rae Brothers, later going on to study music and relocate to Paris. What a life! Last night the sun shone, Brown Ale flowed, the band played great as Ian Wynne’s dazzling ragtime to stride piano playing held the audience in its thrall. The gig wasn’t a ‘band plus guest gig’ – well, not until Wynne’s short solo set! – rather a band playing New Orleans’ jazz, in the style with solos, such as they were, succinct, to the point. I like it like that sang guitarist and classy banjo player Dave Rae. The all seated frontline included the veteran trumpeter Mick Hill who featured playing muted trumpet on Carolina Moon. Either side of Hill were stalwarts Liz Bacon on clarinet and Jim Blenkin, trombone. 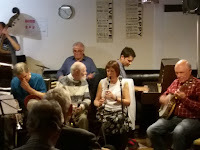 The boys in the engine room – John Robinson, double bass (make that ‘string bass’ in this context) and drummer Paul Bacon – set the tone for the evening; the least obtrusive, yet incisive rhythm support one could wish for on this Springwell/Mississippi paddle steamer. Time for the unassuming Ian Wynne to step up; Professor Longhair’s Mardi Gras. Piano and vocals to die for, Wynne singing Well I’m goin’ to New Orleans…I wanna see the Mardi Gras. Wynne sang side on to the upright, clipping the lyric Well I’m goin’ to New Orlean, purposely omitting the letter s from Orleans to great effect. Dave Rae sang with feeling and on this date contributed several tunes including Make Me a Pallet On Your Floor and, switching to banjo, When I Move to the Sky. Another bottle of Brown Ale (a trusted friend in a non-real ale environment!) came with a schooner, yes, a schooner! Jazz economy raffle tickets purchased (subsequently filed under ‘bin’! ), and it was time for the second of three sets. Guest star Ian Wynne played a short solo set. We knew he would play solo – he didn’t travel from Paris not to play a few tunes! – and twenty minutes later some got to their feet to lead the well-deserved applause. First Mule Walk Stomp (James P Johnson), Echoes of Spring (Willie ‘The Lion’ Smith) followed, then Wynne’s set piece, Meade Lux Lewis’ Honky Tonk Train Blues. For the record, this was piano playing of the highest order. Regional promoters could do worse than offer Wynne a gig, here’s hoping! And our star guest wasn’t finished yet. 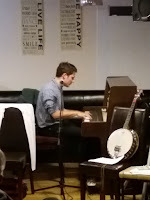 Fats Waller followed and Wynne closed his set with a tune readily associated with Muddy Waters, Got My Mojo Working playing piano and singing. An ‘I was there’ occasion. Mac Rae belatedly joined the band for a third and final set playing trumpet alongside Mick Hill and singing a couple of numbers. Wynne resumed his role as an equal among New Orleans’ equals. 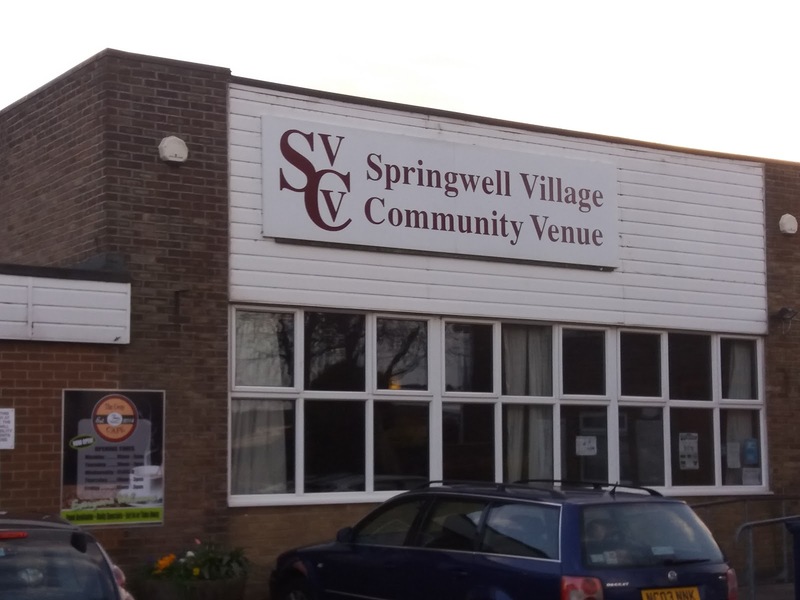 It was a fine evening of New Orleans jazz, and, weather-wise, it was ‘such a lovely day’ to travel out to Springwell Village. Next week the Community Hall New Orleans Band welcomes another guest. Ex-pat trombonist Roy Rubenstein flies in from Chicago. 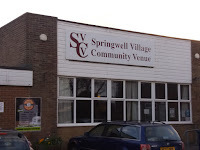 All roads lead to Springwell, Wednesday 25 April. 8:15 start, three quid at the door. Recommended.